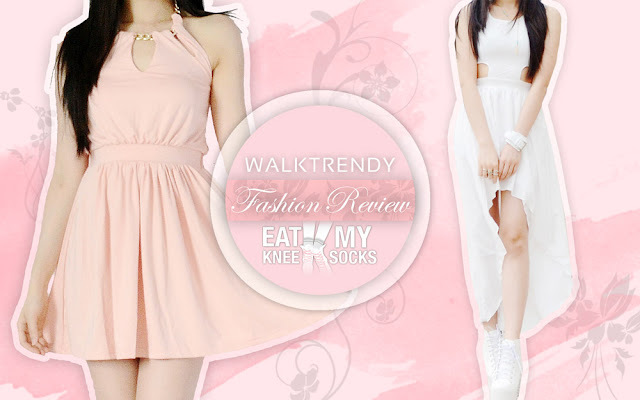 I chose two dresses from WalkTrendy this time, including a pink halter dress and a white asymmetric-hem dress. Processing of the order took about five days, and shipping took less than two weeks. 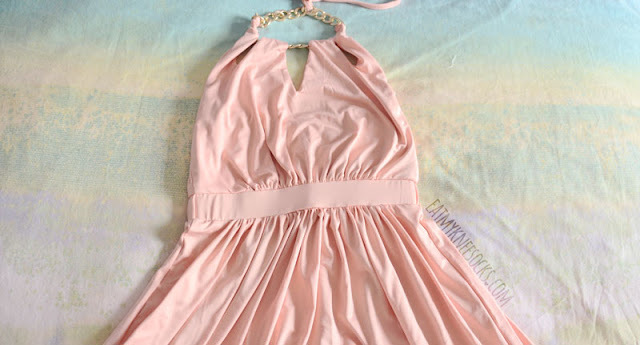 The first dress that I got was a short, sleeveless pastel pink halter dress with a golden chain neckline. This dress costs $29.99 with free shipping and is sold in sizes XS-XXL. This dress has a thick elastic waistband and ruched design. The fabric is smooth and soft with a bit of shine, and it doesn't wrinkle easily. On first glance, the dress looks exactly as pictured on WalkTrendy's site! On closer examination, the waistband seems slightly different, but nonetheless it's quite accurate to pictures. The thick elastic wastband is very stretchy and gives the dress its shape. The top is a bit too loose for my liking, though the neckline is adjustable. I chose this dress because of the unique neckline details. There's a thick golden chain, with fabric wrapped around it in a way that creates a lovely cutout design. The chain itself adds a nice touch, like a golden necklace. It looks great with matching golden bracelets or rings! The quality is also very good, though the fabric looped around the chain needed some adjusting when I first got it. The fabric is thick enough to be opaque, but not too thick. It might get a bit hot in the summer, but overall I like the thickness. The measurements on this halterneck dress fit WalkTrendy's product description, and for me it's a great length. Halter dresses rarely fit nicely on me, but this one fits quite well! Overall, this pink chain halter cutout dress from WalkTrendy is a great buy, with a cute style that can be dressed up for a summer party or dressed down for a day at the beach. You'd definitely need a good strapless bra to wear with this, though, so keep that in mind. The second dress that I picked was a high-low dress with cutouts at the waist and the back. WalkTrendy sells this dress in white and black, sizes XS-XXL; I got it in white. Compared to the pink halter dress, this white high-low dress wrinkles a lot easier. The fabric is thinner as well, but the dress is lined and there's a second layer for the skirt, so it's not too see-through. The cutouts are a bit higher than pictured in WalkTrendy's product images, but otherwise the dress looks exactly the same! The fabric is just the right weight to be flowy and angelic without being sheer. This dress only costs $27.99, and for such a lovely style I'm impressed by the price. The quality of the outer fabric isn't the absolute greatest, but the inner lining is soft, smooth, and comfortable. Asymmetric hems, or high-low hems, have always been one of my absolute favorite trends. Maxi dresses often aren't very flattering on me, since I'm rather short and all. I tend to reach for short dresses, but I love high-low dresses because they add that kind of graceful, goddess-like touch. 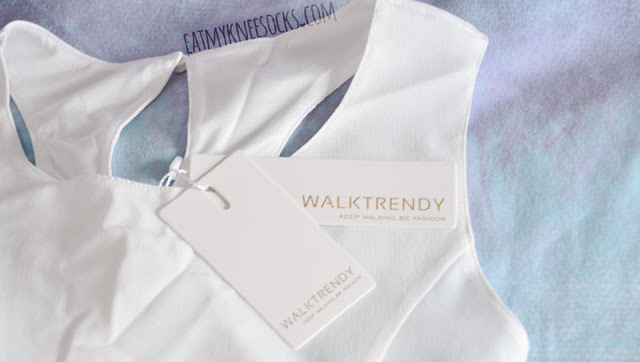 WalkTrendy's high-low dress ends at the perfect length for me, both at the front and at the back. With strappy summer wedges or heeled platform shoes, it's super eye-catching and truly gorgeous! Sizing-wise, the dress fits wonderfully, though the fabric doesn't have much stretch to it, so if you're thinking of ordering it, be sure to measure yourself carefully. I'd recommend sizing up, since the waistband gets a bit tight. This high-low dress is so unique yet versatile, and you can style it so many ways. Wear it over a bikini as a beach cover-up, with a leather jacket and boots for a autumn look, with flash tattoos and golden jewelry for a boho-chic vibe, or with killer pumps and statement accessories for a bold party look. Words cannot express how much I love this white asymmetric-hem dress, so I'll let the pictures do the talking! The pink halter dress and white high-low dress were actually the only items that I selected, so I was surprised to find a small bag with a ring set and necklace included! I'm not sure if this was a free gift or a mistake, but needless to say it made me pretty happy! So, the ring set that I got was the 8-piece multi-color set from WalkTrendy. Priced at $10.79, this set has a combination of silver, golden, and black rings in various designs. 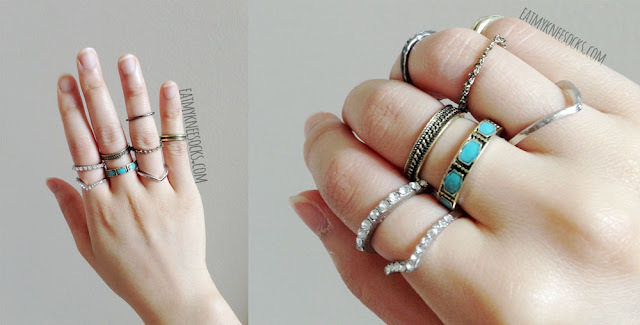 I love ring sets, since you can really get creative with them and pair them however you like, or wear them separately with other jewelry! The rings in this set are pretty well-made. There are ones with rhinestones, ones with carvings, ones with painted details, and some simpler ones as well. I noticed that a few of the gold/bronze-toned rings leave a bit of color transfer on my fingers afterwards, but otherwise I've got no problem with these. 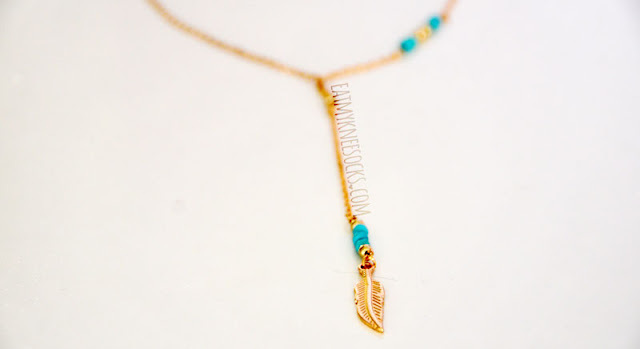 The second piece of jewelry that I got was a golden necklace with turquoise beads and a feather pendant. This necklace is currently on sale for $8.54 at WalkTrendy. The necklace is delicate and lightweight, but well-made, with a lobster clasp at the back. It has a short loop around the neck, with an extended chain and feather pendant at the front. I never expected to get this golden feather necklace, but I really, really like it!